craftyblossom: grey and white herringbone quilt. 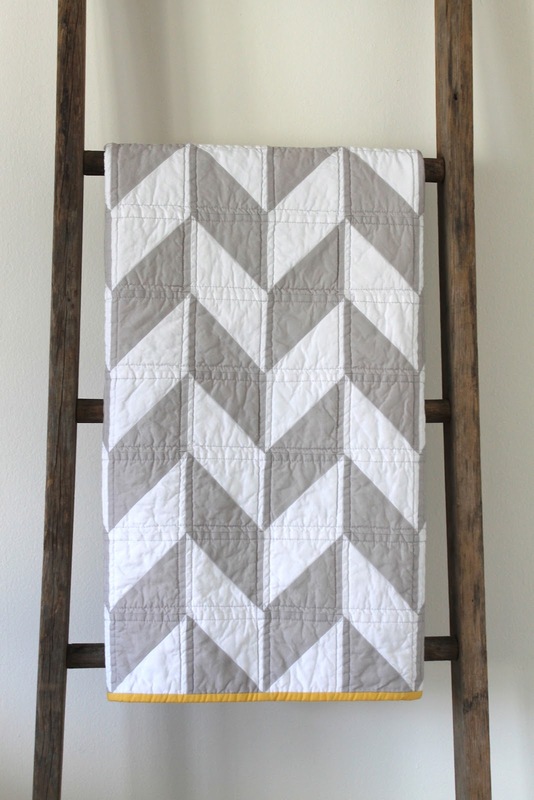 grey and white herringbone quilt. Yep, another one bites the dust. This time, with a slightly softer yellow binding. I just finished a yellow and grey herringbone, inspired by you. I'm going to use teal for the binding. It is so fun to see what you are coming up with. Perfectly beautiful! The backing turned out great even it was a pain. I just LOVE LOVE LOVE this quilt. You did wonderful job, and the colors are so perfect. Thanks for sharing! Beautifully done! I love the backing almost as much as the front. I know i'm working backwards through your posts, but wow, you do churn the quilts out and they're all gorgeous! I have centering marks on my work table. I tape toothpicks to those marks when I'm ready to pin baste a quilt. I can feel the toothpicks through all the layers which helps me keep them aligned. I love the scale of your herringbone! How big are your HST blocks? 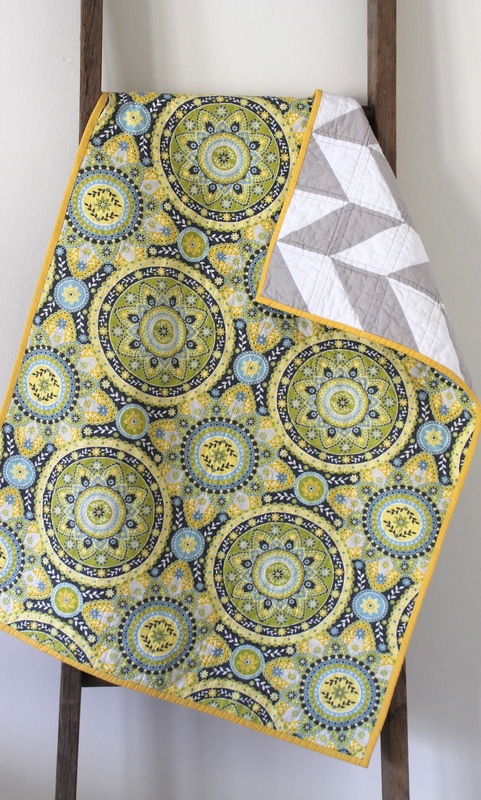 I as well love this quilt and have a question - what size are your half square triangle blocks? Wondering if you would share your pattern, or if you sell it? I'm hoping to make something like this for my little one. Thanks! Sorry Jane L again. My correct email actually is jgleahy@bigpond.com many thanks from Australia. 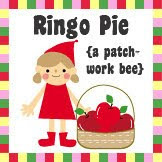 My daughter-in-law loves this pattern and would like me to make a baby quilt for their first child due in February. 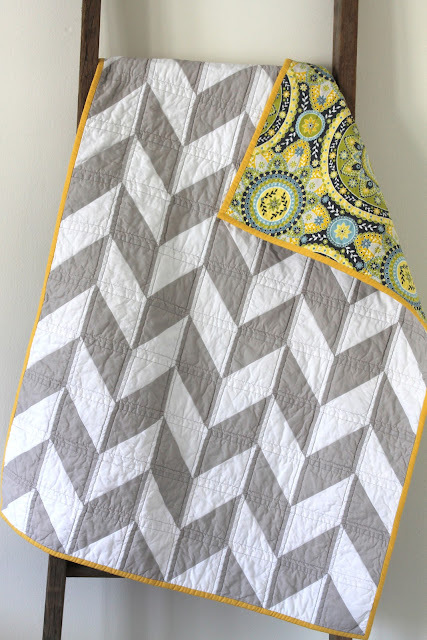 Please tell me the dimensions overall of the quilt and the size of the triangles (or squares) you used. Thanks so much, been searching for a pattern and have not been successful. Hate to "wing it" without some basic info! I love this pattern and want to make it for my grandson who is getting married next spring. Where can I get this pattern, in queen size hopefully? 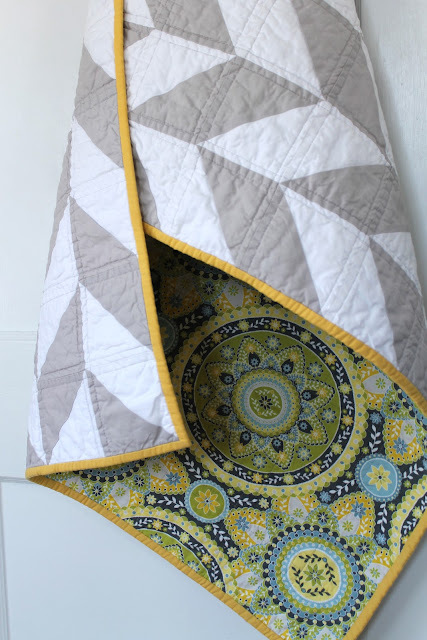 Would love to make this quilt, can I purchase the pattern or what size are the blocks? WHERE DO I GET THIS PATTERN , I WOULD LIKE TO MAKE IT FOR A WEDDING SHOWER GIFT.